I was recently asked where I shop for the ingredients I use in my recipes and on a daily basis. This post is geared more towards the UK readers than others but there are still helpful tips that you can apply to your own life, wherever you live in the world. 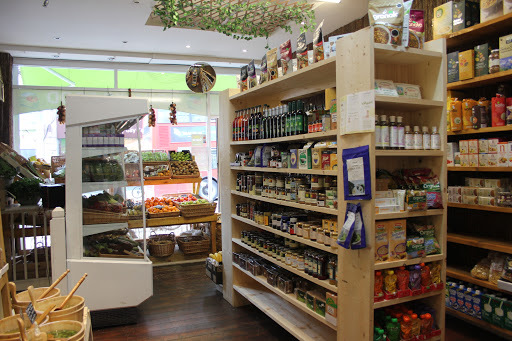 Organic Food, on Stroud Green Road, Finsbury Park, London. Not everything I buy is organic, not by a long shot. I am a student, after all, and that means I have a very limited budget for food. I allow myself £30-£40 per week (remember I run a food blog, so I spend a little extra on food for some recipes). At the entrance, you pick up one of these adorable wicker baskets. Beats the plastic baskets at most supermarkets any day! With the little bit of money I have, I do still have the power to make an impact on my local community. By choosing to purchase my food from small, local shops, I am supporting struggling businesses instead of filling the pockets of big multinationals and chain supermarkets. Fresh produce is usually much cheaper when you buy from local shops, so that’s where I save a lot of money. Those savings are then usually spent on more expensive products like organic nut butters, wholegrain pasta, soy yogurt and nut milk, raw chocolate, etc. They’ve recently expanded the chocolate shelf. Heaven. 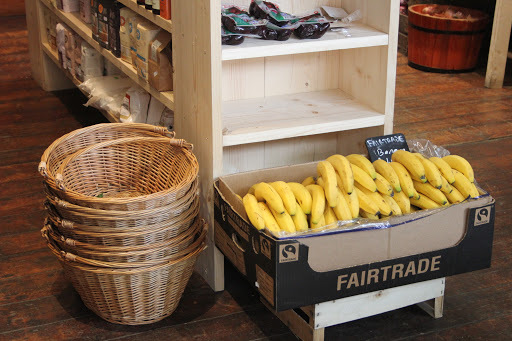 BONUS: when you shop in your local fruit&veg shop, you also connect with the people who run that business. They will appreciate your support and maybe even reward you: the guy who runs the organic shop here sneaks in a free punnet of raspberries into my shopping cart every once in a while! I never find everything I need in that little shop round the corner, but I try to get as much as possible there. What I can’t find in small shops, I get from the supermarket. If one week I am particularly short on money and need to pinch a few pennies, I also get the cheap stuff (tinned tomatoes, nut milk, grains) from the supermarket. Tesco is just round the corner, so that’s my go-to supermarket. Out of my £30 per week, I usually spend £5-£8 at Tesco. It’s not my favourite supermarket by far, but it’s convenient. Sainsbury’s (Local) is also close to me, so that’s another place I can get cheap ingredients, but it’s rare that I go there. Waitrose If I were stupendously wealthy, I would shop here all the time. Waitrose is just nice. 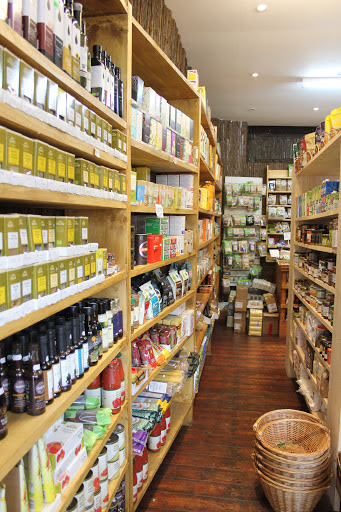 It’s clean and organised, the staff are friendly, they have an enormous range of organic and ‘rare’ ingredients. I find lots of specialty vegan products here that I can’t find in any other supermarket (especially healthy convenience foods and ready-made meals). But unfortunately, I am a student, and Waitrose is not budget-friendly. I splurge here every once in a blue moon. I never go to Morrison’s and Asda. I get a bad vibe from those supermarkets, they’re just too big and crowded and I find few things I like there. 1) Look out for the vegetarian and free from aisles: this is where you will find raw snack bars, dairy-free chocolate and gluten-free products, as well as faux-meat products. 2) In the freezer section there are always a few vegetarian and sometimes vegan options. Large supermarkets will sell Linda McCartney sausages, for example, and I know that in large Sainsbury’s or Tescos I can find Swedish Glaze vegan ice cream, sometimes also Booja Booja and others. Last but not least, WHOLEFOODS. Again, if I were immensely wealthy, I would take the Tube to High Street Kensington every week and do a massive shop there, but alas. You will find dairy-free ice creams, yogurts and milks there, faux meats and cheeses, allergy-free products, and much, much more. BUDGENS also often sells faux meats and cheeses, and last time I was there, around Christmas time, they were selling dairy-free chocolate advent calendars. There are farmer’s markets in London but unfortunately they all are quite expensive (due to city laws and taxes, probably). However, these are another place where I like to splurge every so often. For example, I love saving up during the week so I can go to Borough Market or Spitalfields at the weekend and treat myself to a lovely loaf of sourdough or a superfood burger. Vegan and vegetarian food stalls are popping up at these popular markets more and more. These are a great place to find specialty products. 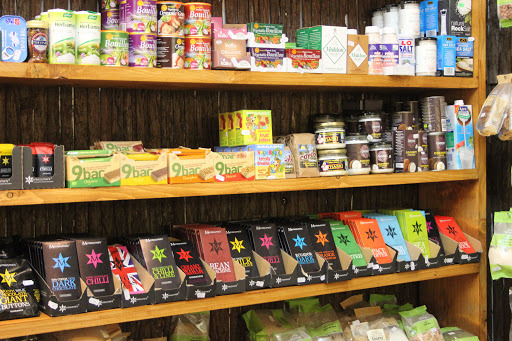 They sell foods like carob, dairy alternative, meat alternatives, superfoods and allergy-free foods. 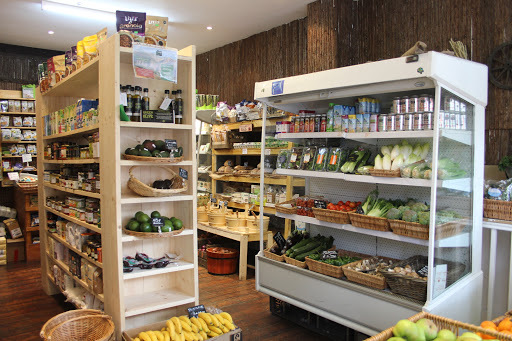 My favourite shops and chains include Planet Organic (simply the best! 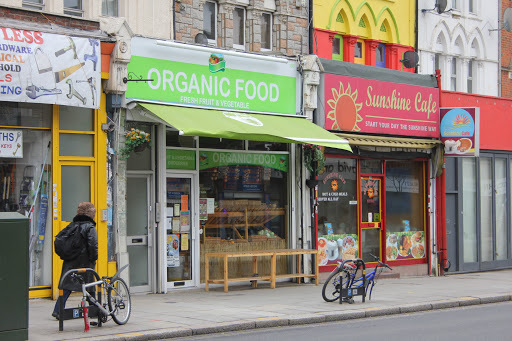 ), Holland&Barrett and Mother Earth (on St Paul’s Road, just by Highbury&Islington Station). Wholefoods will also sell vegan-friendly products, but it’s a bit pricy. This is where the magic happens. If all the places listed above still don’t carry the products I need–such as rare vegan/raw/superfood products–the Internet is where I can find them. Amazon will usually have whatever I need, but there are many websites specialising in vegan foods. Veggeo is a brand new online supermarket that just launched in the UK. Take a look at my interview with the owner and founder, Peter Watkins, here. Other websites include veganwebstore.co.uk and realfoods.co.uk. Animal Aid is another favourite of mine, because every time you shop there, you know you’re supporting a great cause. Thanks, glad you enjoyed it. I write mostly recipes, but every once in a while it's nice to include a little extra info. They even do special delivery boxes.